Summer Scoop 2018: the old dog party of the year! You are here: Home / Summer Scoop 2018: the old dog party of the year! More About Summer Scoop 2018: the old dog party of the year! Join us and party with your old friends and make some new friends. Oak Grove features a large covered pavilion and plenty of shade for fun rain or shine. Prizes, contests, raffles, silent auction, treats, food, and games, and contests galore--best summer attire, best in shades, coolest dude, coolest gal, human/canine look-alikes, oldest dog, farthest travel, goofiest dog, best kisser, and most inspirational story. There is something exciting for everyone at the 18th annual Summer Scoop and Reunion. Meet former WKYC meteorologist Bruce Kalinowski, a local celebrity and special supporter of old dogs, and the fabulous staff and veterinarians at the Tremont Animal Clinic in the historic Tremont neighborhood of Cleveland, Ohio. Paw print painting: Preserve your old pooch's paw in non-toxic, washable paint. Get a print of your best friend's paw print suitable for framing. 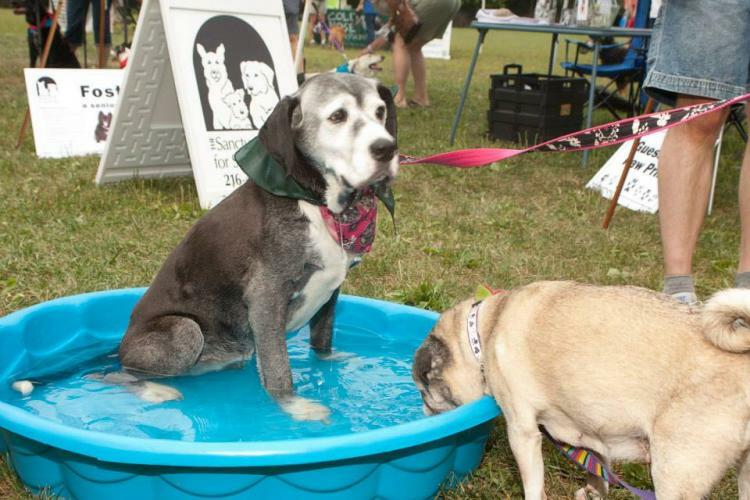 Old Dog Olympics: An agility course paced just right for old dogs. Your old dog can wander through the tunnel; jump the hurdles, or stroll through the weave poles. The Old Dog Olympics are a popular part of the Summer Scoop! Every old dog is a winner and will receive a gold medal for participating! In 2018, the Old Dog Olympics are hosted again by our friend Chris from Woofwise Dog Training. Chris is a true friend to senior dogs, hosting a White Whiskers class several times a year to give old dogs another opportunity to socialize and learn. Massage for your Pooch: Your old friend will enjoy a relaxing mini-massage courtesy of Jeff Varga of the Trotting Troubadour. You will also learn some basic massage techniques that you can use at home. Relax in the shade and enjoy a host of light vegan refreshments, including cool vegan ice cream. For the dogs (and people) who just like to relax, there are lots of shade trees and a large, cool shelter with plenty of picnic tables and refreshments. As always, admission and parking are free. Fully accessible.